Stars including Justin Bieber and Rihanna have tweeted their support for Sean Kingston, who is in intensive care after crashing his watercraft into a Miami Beach bridge. Sean and a female passenger were injured when the watercraft hit the Palm Island Bridge on Sunday, Florida Fish and Wildlife Conservation Commission spokesman Jorge Pino said. Justin, who worked on the hit Eenie Meenie with the hip hop artist, posted a message of support on Twitter. 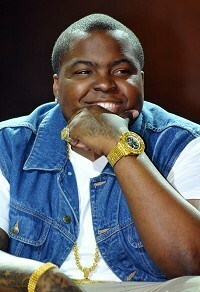 He wrote: "Got my friend Sean Kingston in my prayers tonight. A true friend and big bro. Please keep him in your prayers tonight as well." Rihanna tweeted: "Sean we praying for u baby." Flo Rida, who has also worked with the star, said: "I'm praying for my brother Sean Kingston. Everyone please pray for our brother" and Nicki Minaj, who collaborated with Sean on Letting Go, tweeted: "My love and prayers are with Sean Kingston and his family." LL Cool J also tweeted his support. A publicist for the Beautiful Girls singer said his family was grateful for everyone's prayers and support. Pino said authorities are investigating the crash, and "nothing at this point would indicate that alcohol played a role." Sean rose to fame with his 2007 hit Beautiful Girls. His self-titled debut album sold over one million copies worldwide. Acts which played the Glastonbury Festival 40 years ago, including Linda Lewis and Nick Lowe, are to perform the event once again on a newly introduced stage. Lady Gaga has revealed her Monster Ball tour left her bankrupt after she spent so much money ensuring every show was perfect. Beautiful Girls singer Sean Kingston has been taken to hospital after crashing his personal boat into a Miami Beach bridge. Lady Gaga's latest album Born This Way has stormed to the top of the charts this week, selling more copies than the rest of the top 10 combined.